The fourth yacht in the Moonen 97 mini series is now launched and ready to be delivered to her future owners. 'All the experiences gained by the yard and by the owners of the first three Moonen 97s have been integrated into number four,' says Emile Bilterijst, managing director of Moonen Shipyard. The latest Moonen 97, currently known as hull number YN 193, offers a prestigious pedigree: naval architecture by Diana Yacht Design, exterior design by René van der Velden and an interior styled by Art-Line. 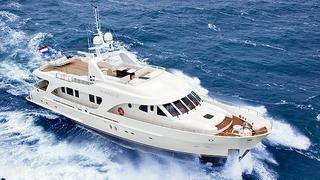 This series was also a finalist of the World Superyacht Awards 2011. Lloyd's registered and MCA compliant, this 30 metre motor yacht built in steel and aluminium can accommodate eight guests in a full-beam master suite, a VIP cabin and two twins. On the technical side, the Moonen 97 is powered by twin 448kW Caterpillar C-18 DITA engines giving a top speed of 13 knots, a cruising speed of 12 knots and a range of 4,500 nautical miles at 9 knots. The Moonen YN 193 will participate to the next Festival de la Plaisance in Cannes, and the Monaco Yacht Show in September.